Paintings where matter is a song to images and texts put together in giant puzzles in an organized happy disorder! A real meticulous work mixing acrylic, marker pen and collages, each canvas is an invitation to dreams where the images speak for themselves and play with our eyes, urging us to find links to a greater depth…The artist’s studio, supported by the city of Cannes, is in the historic district of the Suquet in Cannes and can be visited but only on appointment. An XXL design oil painting ! 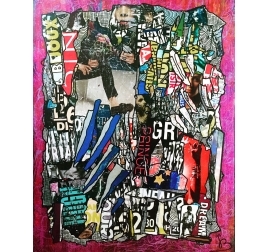 This contemporary oil painting canvas mixes old posters collage and marker pen work. The dimensions of this large size art oil painting are 162/130 cm. This design wall decoration is delivered with care and the delivery cost varies with the geography. 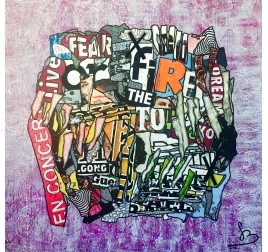 The contemporary artist Gregory Berben on a deco canvas ! 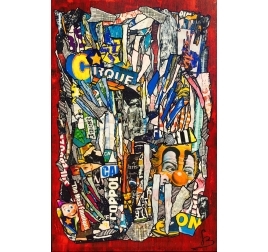 This acrylic painting mixes old posters collage and a work with a marker pen. The dimensions of this modern painting canvas are 114 cm X 146 cm. This design artist canvas is delivered with care and the delivery cost varies with the geography. A colour explosion on and abstract canvas ! 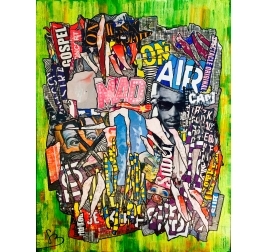 This modern painting mixes old posters collage and a marker pen work. This large size deco canvas is 97 cm X 146 cm. This artist wall decoration is delivered with care and the delivery cost varies according to the geography. Gregory Berben’s world on a modern oil painting ! This design wall decoration mixes old posters collage and acrylic paint. The dimensions of this large size oil painting are 100 cm x 100 cm. This deco art oil painting is delivered with care. The cost of the delivery varies with the geography. 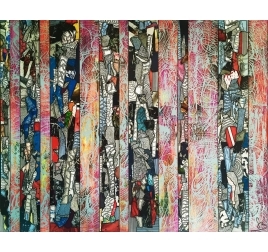 Discover Gregory BERBEN’s world in colored wall decoration ! A technique mixing acrylic paint, old posters collages and marker pen. This large contemporary painting is 114 X 146 cm. Artist’s canvases are delivered with care, the cost varies with the geography.